Holy Cow Batman, that Geek Chic is not a chick at all. Actually I believe Robert Gifford, the owner of the Geek Chic Custom Gaming Furniture Store, pronounces it "Geek Sheek". The Geek Chic Custom Built Gaming Furniture is all about Quality. Each gaming table is custom built just for you in what Gifford calls "Heirloom Quality Furniture" to pass down to your little geeks. From some of the comments I have read, the Geek Chic associates are very active in making sure they design and build you the very best gaming table for all the games you enjoy. This starts with a phone call to get to know you on a personal level so they can design a piece of quality furniture that clearly has your personal taste in mind. In addition to their famous gaming tables that convert to a coffee table when not in use, the Geek Chic Master Wood Workers also produce quality chairs, bar stools, dice towers, and storage cabinets for miniature collectibles and comic books. As you can imagine with anything that is custom made for you, there also comes a price. 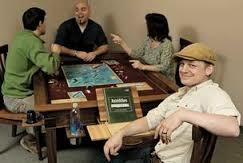 The average custom gaming table will set you back about $3,000.00 and goes up from there. A little pricey in most peoples book, but then again, this is Heirloom Quality Furniture that will last a life time. Coming from someone who has been in the Tree Industry for most of my adult life, I very much like just about anything made out of good quality wood. All the Geek Chic furniture is made with the real wood it represents and is not stained to make it look like something it is not. It's surprising how many quality furniture makers use this tactic which I suppose it still looks good but it is not the real thing. All the gaming tables are made with Cherry, Walnut or Maple and all with a natural stain finish. As far as the price goes and after looking at the craftsmanship that goes into one of these gaming tables, personally I'd rather take down a $3k tree over someones house then try reproducing one of these gaming tables myself. Getting a deal with the Sharks for a business that only makes custom made furniture may pose a problem if Robert does not have a plan to majorly expand production. This business model in itself could easily get so far behind in trying to keep up with demand (especially after it airs on the shark tank) that they could very well lose some orders from impatient customers. On the other hand if they were producing a few different mass produced gaming tables that would suit most people, then they could certainly ramp up production to the Sharks standards of profitability. But would that hurt the company's brand as Heirloom Quality Furniture? Another concern I have is with the Geek Chic website. There's very little information. Hopefully, someone will take a little time updating the website before this Friday Night. It's hard to imagine they did get a deal with the Sharks when the website's still incomplete on several topics. It looks like we'll have to wait and see if the Geek Chic got a deal on the Shark Tank. Loved the pitch, loved the owner, loved the product. 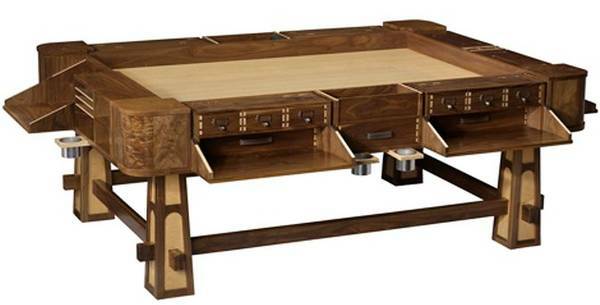 There are so many reasons that this table would be great for tabletop gamers that it'd be heresy not to buy one. The only problem - I just don't have $3k to blow on a table that serves the same purpose as a table I got for $20 at a garage sale across the street. More power to these guys, but you're gonna have to win more than a few hands of poker to be able to afford these things. I'm in, we have 4 kids and love a family game night. With 2 current teens, the idea is great. Plus Family game night will be so much easier. However it can be used for so much more. Anyone who has put together a school project or child's toy will appreciate the ability to keep all the parts together in the ( compartment) area. Plus, lets talk crafts, ect.. I constantly have to move my "projects" and this would protect and store. While being used as regular table. But I will admit that its not free. You get what you pay for. Want cheap, not your table. But in my experience the stuff doesn't last. So its just much better to spend a little more. Its an investment not only in furniture but in America.